Parking lots, public bathrooms, and entry ramps all have that same familiar character. 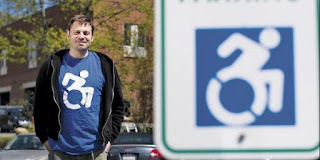 It's the blue-and-white stick figure in a wheelchair, leaning slightly backward in comfortable repose, on signs that mean "handicapped." The image looks passive, even helpless. For years there have been scattered efforts to replace it with a more active representation of people with physical limitations. That may finally happen, thanks to several years of pushing by a motley collection of determined activists at Gordon College, a small Christian institution in eastern Massachusetts. Their breakthrough is that the City of New York, in a move that could spark similar updates worldwide, has now agreed to use a Gordon-inspired logo that shows the stick figure with active arms, leaning forward, a participant rather than a dependent. "It's such a forward-moving thing," said Victor Calise, commissioner of the New York mayor's Office for People With Disabilities, who plans this summer to begin putting the new logo all over the nation's largest city. Similar attempts at changing the logo have had limited results, said Brian Glenney (pictured), an assistant professor of philosophy at Gordon, who led the effort. New designs have been adopted by some retailers, a college campus, even some smaller municipalities. But none, clearly, the size of New York. "There's finally reception for the idea," he said. Other advocates agreed. "Oh, man, wow—that will make a splash," said Wayne Sailor, a co-founder of TASH, an advocacy group for the disabled, who is a professor of special education at the University of Kansas. "I predict it will be a real trendsetter." Mr. Glenney is known at Gordon for a youthful history of spray-painting graffiti alongside fellow practitioners of underground "public art." His idea for the logo redesign was given shape by Sara Hendren, a graduate student in design studies at Harvard University, whom he met through an artist friend. Their initial "lab work"—placing stickers of test designs over parking signs on the Gordon campus—was quietly approved by the college's assistant director of physical plant, Mark Stowell, who did his best to ensure legality by checking with a few colleagues and digging through rule books. Mr. Glenney and Ms. Hendren sat beneath the reconfigured signs and listened to the reactions. They then settled on a final version and distributed stickers among friends, who plastered the image on signs in Boston, 30 miles to the south. From the start, it was a stealth operation, bringing to life Mr. Glenney's concept of art as a way to challenge preconceptions and create change by "defamiliarizing the familiar." Already there are hints of what's to come from the Gordon-to-Gotham partnership. New York is rolling out a new line of taxis designed to accommodate people with disabilities, and the winner of the competition to supply the specially configured vehicles, Nissan, has agreed to use a version of the Gordon logo with an outstretched hand—a stick figure hailing a cab. The success of the new logo did not result from an elaborate, well-financed lobbying campaign. Gordon's director of marketing communications, Cyndi McMahon, simply tried calling various possible partners, including the United Nations. There she found Fred Doulton, a social-affairs officer at the U.N. Secretariat for the Convention on the Rights of Persons With Disabilities, who got Mr. Calise's attention in the mayor's office and has been spreading the word about the new symbol through the U.N.'s "Enable" newsletter. Mr. Calise himself was paralyzed from the chest down in 1994, at the age of 22, in a bicycling accident. The common stick-figure logo, created by a Swedish graphic-design student in 1968, is "stagnant," he said, "and there's no movement, and it makes people seem like they don't do much with their lives." Mr. Glenney became interested in disability issues through his work in the philosophy of mind and perception. He has a lab to test out ideas, and while he and Ms. Hendren were experimenting with a device that might help users perceive colors by listening, they came to realize that the standard graphic representation of people with disabilities was "really awkward," he said. "It's bad art." Ms. Hendren noticed a few places that used more active versions, including New York's Museum of Modern Art, and wondered why they weren't used everywhere. Members of groups such as TASH have long wanted an update of the standard logo, Mr. Sailor said, but are often busy enough fighting to maintain legal protections and government resources that disabled people need to live their lives without constant hands-on assistance. "It's easy to kind of look back and say, Why didn't we do this before, it makes so much sense?" he said. Now that Gordon's logo has found a home in New York City, he thinks it may spur a societal reappraisal of what really would be the most helpful solutions. "You wind up talking about much more than a logo," Mr. Sailor said. "You wind up talking about the broader, bigger issues of who are these people, what do they need, and where are we in the present."